Blobfish (Psychrolutes species) don’t need muscles – they have a feeding strategy that consists of sitting and waiting for something edible to go by. As well as that, their jelly-like flesh is slightly lighter than water, so they don’t need to expend energy or scarce oxygen to stop themselves from sinking towards the sea floor. This low-density flesh is an alternative to a gas-filled swim bladder, a feature of many fish in less deep waters. However, at 800 metres deep the pressure is about 80 times higher than at sea level, so any gas would be too compressed to serve the purpose. Also in this photograph is a small red snailfish, another deep-water species with a jelly-like layer. This image has been provided courtesy of the NORFANZ partners – Australia’s National Oceans Office and CSIRO and New Zealand’s Ministry of Fisheries and NIWA. The use of this image does not imply the endorsement of the NORFANZ partners of the content of this entry. I have never seen such a creature. It is so ugly it's cute! How big do they get? OMG, you guys are mean. That scares me! For some reason, it reminds me of a chipmonk... I think its the eyes!! P.s. If anyones in Wellinton, check out the giant squid at Te Papa - Amazing!!! (not as ugly though. 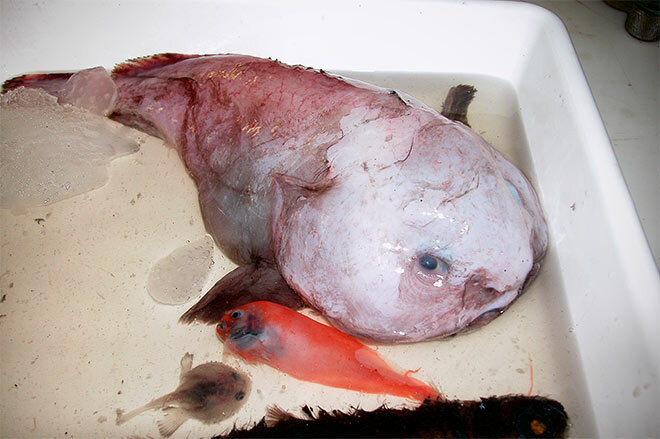 Over-fishing by the Australian and New Zealand deep sea trawlers means the Blobfish is in danger of being wiped out. They're inedible, but unfortunately they live 800m deep and the trawlers are going down to 2000m. He (or she) looks kinda self conscious about being photographed doesn't he (or she)? poor thing. That's the most ugly thing I've ever seen.